This spring, we will introduce the concept of outdoor gardening in our ECC and Summer Camp Program. But, why wait until spring? Check out the ECC’s indoor winter garden! 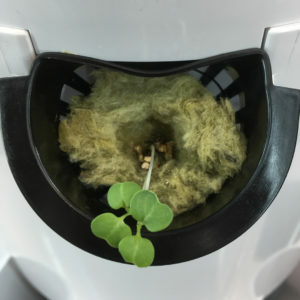 Aeroponic gardening—specifically, a tower garden—provides us with the opportunity to develop a year-round, multi-generational, Jewish gardening and cooking program using innovative aeroponic technology and equipment. The Tower Garden is a state-of-the-art year-round, indoor or outdoor, vertical aeroponic growing system. It is on wheels, so it is easy to move around the ECC. No soil is required and little space is needed to grow vegetables, herbs, flowers, and fruit in less time than it takes for them to grow in traditional outdoor soil gardens. Learning experiences include planting, harvesting, preparing, and cooking crops such as fragrant herbs like lavender, mint and rosemary for spice bags for havdalah; savory herbs such as parsley for our Passover celebrations; flowers such as marigolds and sunflowers to be used for Shabbat celebrations; and vegetables and fruits to be prepared for snacks in our classrooms, community kiddush meals, and holiday cooking activities.